Conflict of Laws in Italy translates the new Italian Conflict of Laws statute, providing a highly practical resource for common law attorneys. Rather than just translating the Italian words and the civil law concepts into English words, the authors have translated the text into common law language and legal syntax. 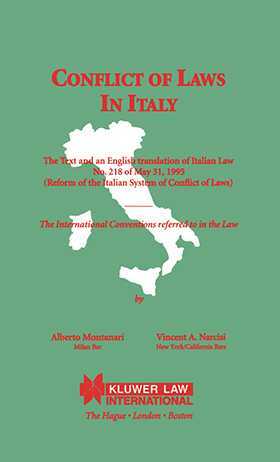 Other unique features include an explanatory introduction highlighting important aspects of the law, a side-by-side dual language text for easy comparison between the Italian original and the English translation, and appendices with English translations of relevant sections of the Italian Code of Civil Procedure and texts of international conventions referred to in the law. Practitioners and academics interested in or potentially confronting conflict of law issues will appreciate this useful resource.